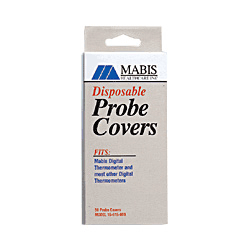 Digital Thermometer Probe Cover from Mabis Healthcare is a disposable probe cover. 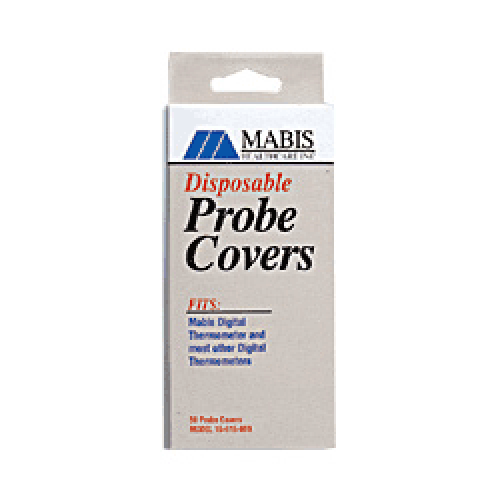 These Disposable Thermometer Probe Covers feature a safe, closed-system that prevents cross-contamination prior to and after patient use. Convenient to use, the Disposable Thermometer Probe Covers help provide a sanitary environment for the patient and healthcare provider alike. The Thermometer Probes are sized to fit most digital thermometer brands. The Digital Thermometer Probe can be used orally, rectally or under the arm. Helps prevent cross contamination prior to and after use. Digital Thermometer Probe provides highly flexible usage--orally, rectally or under the arm. Disposable Thermometer Probe Covers Product Number: 15615000, 15618000. Size: fits most digital thermometer brands.